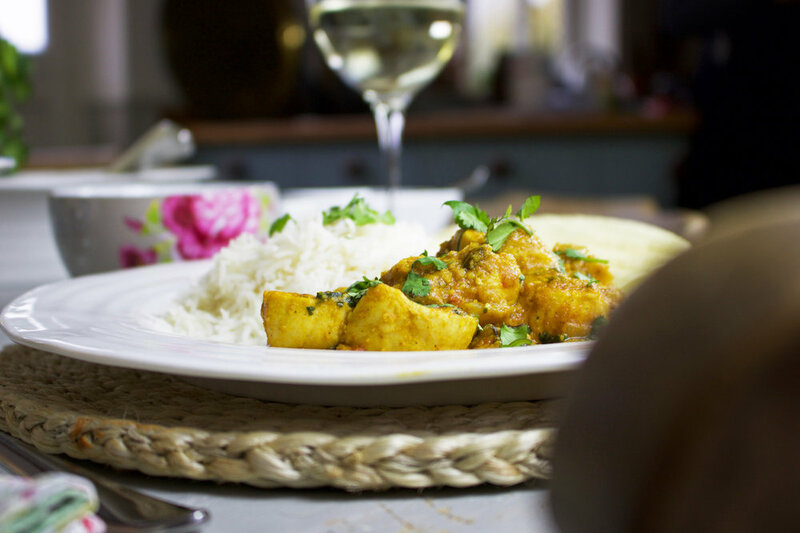 This delicious chicken curry recipe is created by our guest blogger Caroline Winstanley, whose cookery career has taken her from freelance caterer, writing a weekly 'Tasting' piece in the Times newspaper to more recently running hugely successful cookery demonstrations in her kitchen in Wiltshire. Her recipes are for the home cook who wants good food, simply prepared but with no compromise on flavour. Cut the chicken into chunks. Heat the oil in a pan and fry the chicken until browned. Do this in batches. Remove and keep to one side. Saute the onion and garlic in the same pan until softened and then add the curry powder. Stir around and cook for a couple of minutes. Stir in the almonds, the tomatoes, tomato puree, basil and sugar. Add the chicken stock and then most of the coconut milk, using the thick creamy bit at the top of the can. You may not need the whole tin. Bring the whole thing up to a simmer and add the chicken. Simmer for about five minutes if using the chicken breast or fifteen if using the thigh. Check that the chicken is cooked through. Add lots of chopped coriander, the juice of a lime and adjust the seasoning. Serve on spiced or plain basmati rice with an extra wedge of lime. If you are using the spinach, stir through just before serving. The heat of the pan will wilt it very quickly. Poppodums and mango chutney go well. NB You will have some reserved juice from the tomatoes which you can add if you feel it needs it. You can purchase our Sutton Hoo Chicken from The Wild Meat Company. For more delicious chicken recipes head back to our recipe page here.